People are always looking to make their lives better – that’s a fact! We all have an innate desire to seek out creature comforts for ourselves, and sometimes we freak out a little when those comforts start to lose their luster… especially if we invest a lot of money acquiring them in the first place. I know the definition of “a lot of money” varies from person to person, but the fact is we all have stuff we want to keep nice for as long as possible. That’s where we come in. Having 5 simple items around your house or apartment will not only make your life easier, but you’ll soon wonder why you didn’t have a bulk supply tucked away from Day 1! These are everyday items that you know well and most likely have used at a certain point. No doubt many of you already have one or two of these in your homes. Some of you may even have all of them. If you don’t, hopefully you’ll be inclined to stock up after you read this. So let’s not waste any time and let’s check out below 5 products that you always need if you want to make your life better. This is THE oil everyone has been talking about lately. It’s been around forever, but apparently the Western Hemisphere has only caught on to this phenomenon within the last several years. I could be off by a few years, but hey, this isn’t my college thesis so I’m not going to worry about actual dates. Let’s just say, we came late to the party. This stuff is awesome. Also, unlike some other oils, coconut oil is safe to cook at higher temperatures. Substitute it for vegetable oil and use it for frying everything from eggs to your favorite stir fry. It is also a good alternative to butter for your toast or popcorn (or anything else you need butter for). If you drink coffee or tea, put a teaspoon in your cup for a healthy energy boost. For skin care needs, use it as a lotion after your shower and feel smooth and silky all day. You can also mix a small amount with sugar and use it as a body/facial/lip scrub. At the end of the day it works as a natural makeup remover–and while you’re at it, rub some on your feet, knees and elbows to smooth rough spots. Taking one to two teaspoons per day has also been said to help with things such as thyroid function and metabolism. It can also be used for, ahem, intimate times. And don’t forget your pets! Give your dog or cat a small amount (one half to one teaspoon depending on size) for a shiny coat…and for cats it also helps for hairballs. The possibilities are boundless. This is something I’m fairly certain 95% of you already have, but don’t use to its full potential. 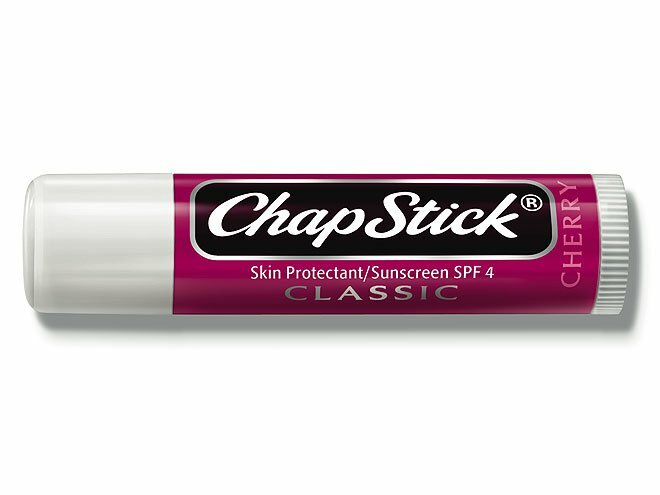 Did you know that when you nick yourself shaving, rubbing chapstick on it will stop the bleeding? Not only that, it’s much more practical than toilet paper in this regard. Not only is it less conspicuous (especially for you guys), but you don’t have to remove it… which ultimately restarts the blood flow. Also, say you have a nice pair of leather boots or shoes. Use chapstick and a buffer cloth to polish them and save yourself a few bucks. If you have a cold or allergies, rub a bit under your nostrils to prevent irritation from repeatedly blowing your nose. For those of you in Northern climates, rub a bit on your cheeks to help with windburn (especially if you ski or snowboard). It also works well as an eyebrow and mustache grooming aid. Finally, for those who dye their hair at home, rub some along the base of your hairline to keep the color from running. Since this product has so many uses, I would recommend at least two tubes: one for your lips and one for everything else. Ha! WD-40 is pretty much a cure-all for anything that’s stuck. The base ingredient is fish oil, so it’s safe to use on almost anything. It’s not just for grease monkeys, either. There are dozens of uses for it. In a way, it’s similar to chapstick, but without the soothing qualities. Use it to unstick zippers, loosen rings off fingers, and untangle necklaces or chains. You can also loosen screws and nails, plus it removes rust and grime! Spray it on clothing stains and let set for an hour; chances are, it’ll remove them. Use it to polish your car and appliances… they’ll shine like new! Plus, it’ll remove all the bug guts. Wipe it on your bathroom mirrors to keep them from fogging up and use it as a wood polish to buff out the scuff marks. Did I mention it also removes residue from Duct Tape? It is the MacGyver of household items! What would the human species do without this? This is one of the all-time best products. Ever. Of course, it has way too many uses to list here, but I can give you a quick rundown of a few of my favorites. I personally use a mixture of Cetaphil and baking soda when I wash my face. I love the gentleness of the Cetaphil and the exfoliating properties of the baking soda. For those of you who want whiter teeth (and who doesn’t? ), put some baking soda and hydrogen peroxide in a cup, mix well and dip in your toothbrush. Scrub for 2 minutes then rinse, 2-3 times a week. Once you get to your desired level of whiteness, cut back to approximately once a week and you’re good to go. This mixture is also good for cleaning your toothbrush – just leave it the cup for about 10 minutes and rinse. Need to freshen your breath? Gargle with a dash of baking soda and water… this is also offers relief for canker sores or if you bite your cheek or tongue (which I have, many times). When you paint your nails and get a little on your fingers, use baking soda and water to get off the excess. Around the house, sprinkle some on the carpet or rug and let it set for 20-30 minutes. When you vacuum it up, it’ll take all those nasty odors with it. Don’t have a rug? Sprinkle it on your sofa cushions and it’ll have the same effect. When you have tough stains on the walls and floors, don’t buy a magic eraser; instead, mix baking soda and water and it’ll do the same thing. If you have a cat, sprinkle some in the litter box and immediately notice the difference. If you like fresh cut flowers around the house, put some baking soda in the water to help extend their life. When in the kitchen, use it to wash your fresh fruits and vegetables. The possibilities are truly endless as this is a wonder ingredient! So, these are just a few applications I came up with for these everyday products. I know there are many more ways they can be utilized, but that just backs up why I think these are such great items to have in any household! And the good news is that they are cheap, so they won’t stretch your budget too much! Previous PostAct Like It's Friday, Friday : Rebecca Black Launches New Music Video Next PostWhat Does Brexit Mean for Travelers & Digital Nomads?